Are You Keeping Your Dog Cool Enough? Your dog has been with you through thick and thin and it’s only natural to want to reward him with road trip fun or time at the beach. But when things outdoors get steamy, it’s easy for him to become dangerously overheated. 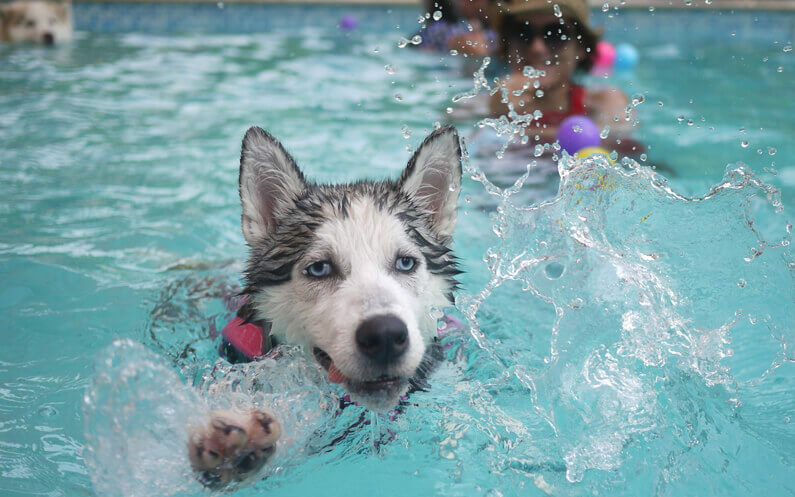 Are you keeping your dog cool enough? These important tips will help you keep your best friend cool and safe all summer long. Leave the midday fetch games behind on hot, humid days. Enjoy exercising during cooler hours in the early morning or evening. Dogs are dependent on a steady supply of fresh water to stay cool, so pack a collapsible bowl and enough for both of you to stay well-hydrated. Asphalt and concrete pavement can reach temperatures in excess of 100 degrees Fahrenheit before the air temperature hits 80. This leaves your dog’s sensitive pads vulnerable to burns and encourages his body to absorb more heat. Try protective booties, or take a cue from your best friend and roll in the grass or pool instead! The temperature inside your car reaches dangerous levels within minutes on a warm day – even in the shade and with the windows cracked. Your dog is safest at home. If you hate leaving him behind, make it up to him by bringing back a special treat! Heatstroke is a life-threatening emergency that requires immediate first aid and veterinary care. Senior dogs, puppies, snub-nosed breeds and those with serious medical conditions are at increased risk. If not treated promptly, these symptoms can quickly lead to seizures, coma and death. Prevention is the best medicine, but if you suspect your dog is suffering heat-related symptoms, take measures to cool him on the way to the veterinarian. If he can drink, offer him water. Apply cool, wet towels to his abdomen, armpits and head. Don’t be afraid to take your best friend on a warm-weather adventure, just take these simple precautions and both you and your dog will have a fun and safe summer! If you have questions about keeping your dog cool or general questions about pet care, you can contact Kara Jenkins, Owner of TLC Pet Sitter. We are also available by email at info@tlcpetsitter.com.